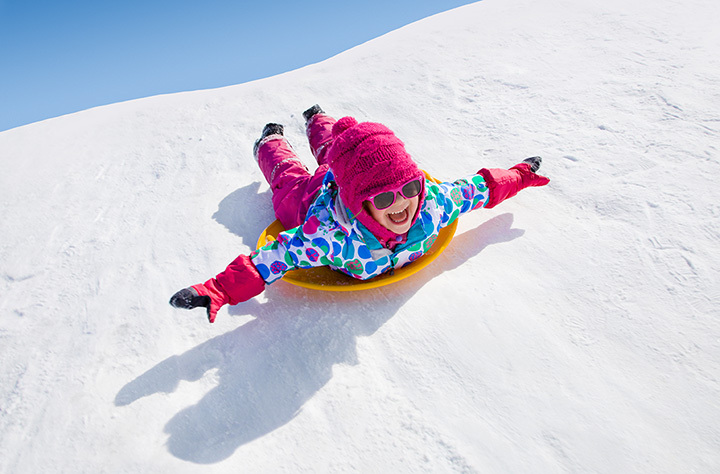 15 of Rhode Island's Best Winter Activities! While a Rhode Island winter might feel too long for some, it’s hardly enough time to sample all the great winter actives the state has to offer. No matter whether you’re a person who prefers to cozy up next to a fire and stay inside or a snowy day adventurer ready to take on the outdoors, you won’t want to miss these fantastic activities this winter. 1. Sign up for an adult ice hockey league! At Rhode Island Sports Center, adults with a competitive streak and those just looking to have some fun come together to play the most quintessential winter sport of them all: ice hockey! Form a team or hop onto your own, and make sure to bring your own stick! During the summer, Diamond Hill State Park in Cumberland, Rhode Island, operates as a gorgeous park with plenty of space for picnics, but head there in the winter and you can take to the hill, which is steep enough for sledding. In fact, at one point it was also used as a hill for skiing—you might pass by the abandoned ski lift equipment if it’s not buried in snow. With tracks perfectly carved into this slope, you’ll be sure not to bump into anyone else on your way down the ramp. If tubing isn’t your thing, you can also use the hill to ski—it’s perfect for beginners, and you can even take classes from Yawgoo’s staff on the spot! Sometimes when the chill is too bitter, it’s best to stay inside on a winter’s day. Luckily, you can do so without even having to pay. Rhode Island museums often have a “free day” for children, families, and even adults. For example, the art museum at the Rhode Island School of Design in Providence is free for all on Sundays. Though you might not find your favorite berries there during the winter, you’ll still enjoy stalls stocked with delicious meats and cheeses, as well as some mouth-watering crepes prepared right before your eyes. While making a day out of visiting any library will do, why not make it Providence’s most charming one? The Athenaeum, in addition to being a great spot straight out of history, also hosts readings and events throughout the year—a perfect way to add a little culture into your winter routine. These fun stroke-by-stroke lessons by Paint & Vino in Providence are a great way to spend a weekend night. You’ll be instructed by local artists in how to create a wonderful masterpiece, and in the meantime, you can also sip on two complimentary beverages that come included with your package. The annual Providence Children’s Film Festival is a must-experience for adults and kids alike. It’s something for children to enjoy, but also allows adults to think critically about the art of storytelling through film. Not only that, but they encourage creativity in your filmmakers, too, with a special youth showcase! This semi-weekly Providence festival goes all out for the holiday season, with special bands, choirs, and artists that they bring in for one special night. The Providence River looks extra cozy lined with Christmas trees and twinkling holiday lights—you won’t want to miss it. While it might be too chilly for the zoo, you’ll be able to stay nice and cozy in an aquarium. And because Rhode Island is the ocean state, you’ll have plenty aquariums nearby to choose from. To learn about local sea life, visit the Biomes Marine Biology Center in North Kingstown or the Save the Bay Aquarium in Newport. 11. Go on a gallery night tour! On the third Thursday of every month, galleries from around Providence open their doors to the public. Whether you’re looking to buy or are just a big far of art, gallery nights are fun for all. While you can tour the city’s galleries yourself, official tours kick off at 5:30 on the nights of the events from the Regency Plaza in Providence. There are a variety of great cooking schools in Rhode Island where you can get a personal lesson or have fun with a group! Learn Italian Cooking from Italian chef Walter Potenza (Chef Walter’s Cooking School) in Providence or even use the kitchens of the culinary school Johnson and Wales! These are skills you’ll be able to bring home right after, too. For those who are fans of the game, Rhode Island isn’t lacking in competition. For a more aggressive hockey experience, check out the Providence Bruins, a professional American Hockey League affiliate of the NHL’s Boston Bruins. Looking for something more family friendly? Brown University’s right nearby, and their women’s and men’s teams are sure to put up a fight against their neighboring Ivy rivals. Winter is the perfect time to cozy up with a friend over a big cup of hot chocolate. At the Duck and Bunny in Providence, you can munch on a crepe or cupcake on the side. But the coziest place for some cocoa? Coffee Exchange on Wickenden Street. From November 18 to December 23, you can step onto the magical Polar Express in real life! This isn’t just a little train ride—your family will spend three hours around the station and living out the narrative of the Polar Express—and that includes a 90-minute train ride. Embrace the holiday spirit with a real adventure!